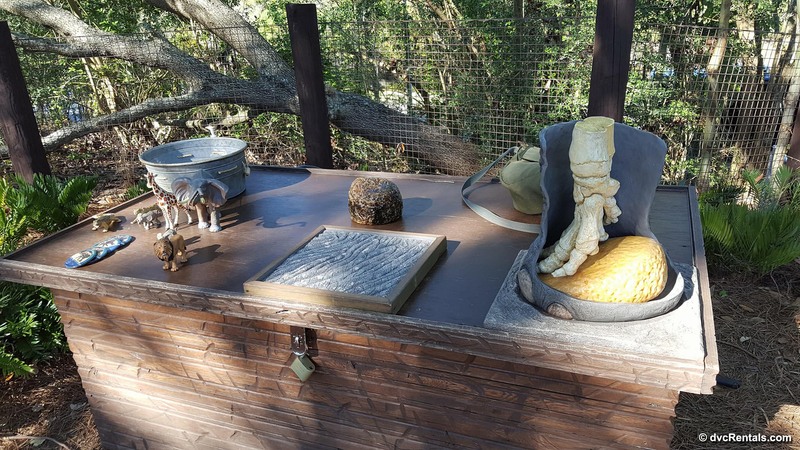 In March of 2017 a new backstage experience was first offered at Disney’s Animal Kingdom. 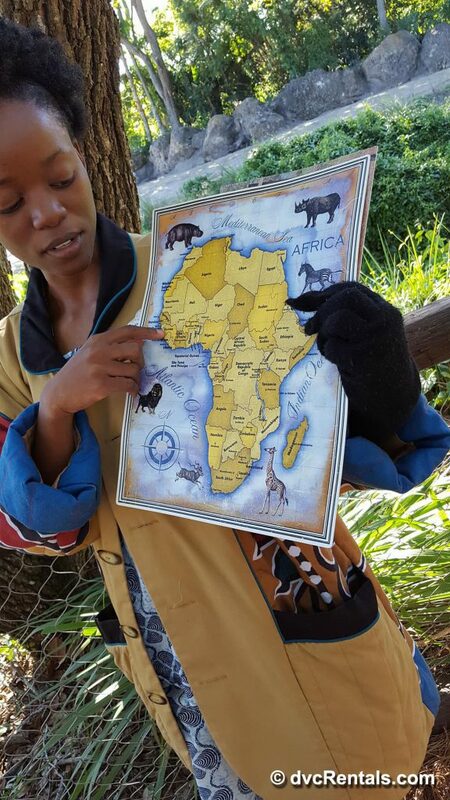 Called “Caring for Giants”, this tour focuses on African Elephants. 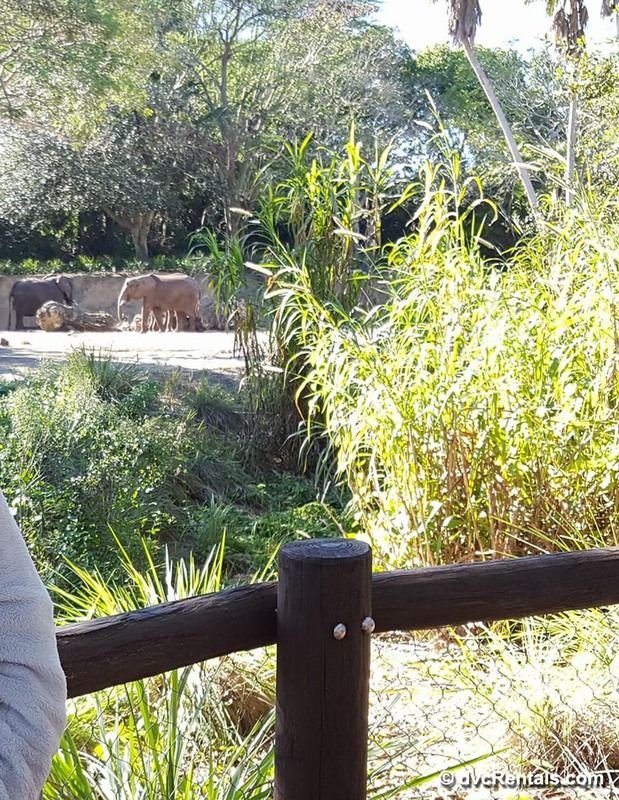 You will be able to get closer to the elephants than you would on the Kilimanjaro Safari Tour, and learn how they are cared for at Animal Kingdom. You will also learn how about the lives of wild elephants in Africa. The tour is an hour long and is offered frequently. There were ten tours the day I went this past week, each of which can accommodate up to 14 guests. There were only four people the day I was there– my friend and I, as well as two other adults we didn’t know. You can reserve in advance by calling (407) WDW-PLAY or by booking at the concierge desk if you’re staying at a Disney resort. However you might get lucky and be able to get on a tour the day you visit by asking at the tour booth where you check in (see below). The tour is for ages 4 and up, but I personally think small kids won’t really appreciate it. There is a lot of talking, and much of what is said would not interest most kids under 8 in my opinion. The cost of the tour is $30, with a 10% discount offered to DVC members and Annual Passholders. There is a 2 day cancellation policy; you will lose your deposit if you don’t cancel within 48 hours of the tour. When you book the tour you’re told to wear closed toed footwear. They also want you to bring photo ID ask that you arrive 15 minutes prior to the tour departure. The meet up area is a booth just to the left before you reach the stand-by entrance for the Kilimanjaro Safari. You’ll sign a waiver (there is nothing dangerous about this tour, the waiver is a formality), and each member of your party will be given a name tag attached to a lanyard (more about the name tags later). When it’s time for the tour to begin your group will be escorted backstage. No photos are allowed in this area. If you are the sort of person that does NOT like to see what goes on behind the scenes you might not want to take this tour. On the other hand if you WOULD like a sneak peek at some off stage areas, this is a great opportunity. You don’t see much, just some of the safari vehicles and a few other odds and ends, but it can be jolting for some, great fun for others. Next the group is loaded into a very non-descript van for the ride to where the tour actually begins. It would have been nice if the van had a bit of “show” on it, but as of now it’s just a black van. It’s a short ride to the elephant viewing area for the tour, 2 or 3 minutes. 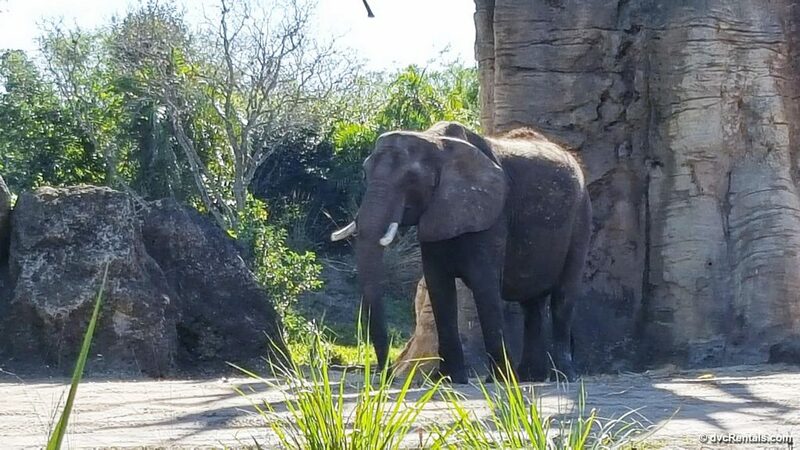 Once you arrive you are greeted by a Disney Cast Member who will tell you all about the care of the African elephants who live at Animal Kingdom. Although you learn plenty from the talk, there are opportunities throughout to ask questions. Marc, the Cast Member we had, was wonderful. 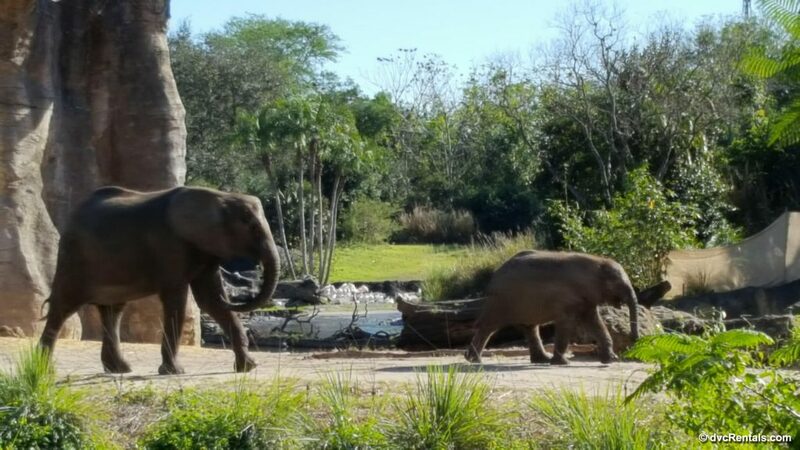 He told us that there are currently 10 elephants residing at Animal Kingdom and that 6 of those were born at the park. The “baby” Stella was born weighing in at 315 lbs. One year later she is now over 1000 lbs! Her Mom’s name is Donna, and she has been the mother to 3 of the elephants at Animal Kingdom. However the leader of the pack is Rafiki, who arrived at the park in 1997 from the Phoenix Zoo. Born in 1979, Rafiki (which means “friend” in Swahili) is an excellent leader. Elephant societies are matriarchal—led by females—and Rafiki is top elephant. 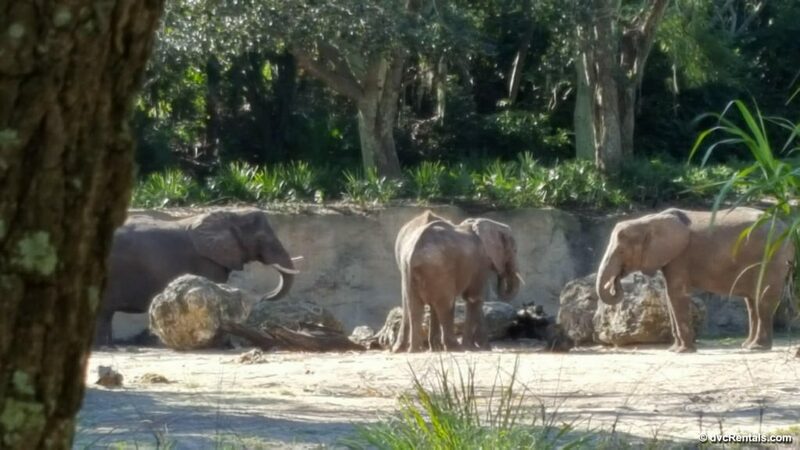 The other elephants won’t go in the water or even eat without “permission” from Rafiki. She watches out for danger and takes good care of her herd. We learned that elephant herds consist of only females and young males. When the males become too rowdy as adolescents they are forced out of the herd and must find a way on their own. At Animal Kingdom there is only one adult 6 year old male (not part of the tour) and he is kept separate from the rest of the herd, just as it would be in nature. 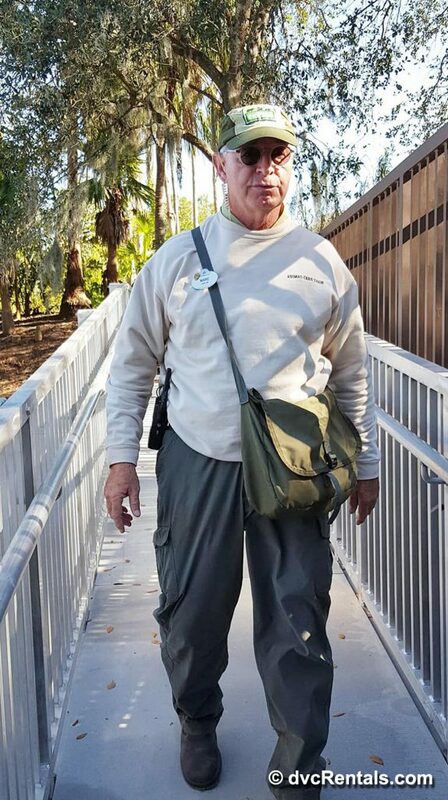 You can usually see him when you ride the Kilimanjaro Safari. Marc told us a lot of interesting facts about these wonderful creatures. You may have heard or read that “an elephant never forgets” and that is actually true. When elephants are reunited after not seeing one another for years there is a whole happy ritual they go through when they meet again. Sadly, they also have rituals when one of their herd has died, and they understand and mourn loss. Some interesting and fun facts we learned from Marc: Elephants sleep lying down; To get blood from the elephants for a blood test they are trained with treats to raise their ears, as the ear is the thinnest and easiest place to draw blood on an elephant; Elephants drink up to 150 gallons of water a day, and have the uncanny ability to smell water when it’s underground. They will dig until they reach the water source; Disney purposely gives the elephants you see on the tour places to hide if they want some solitude; Elephants tend to have dry skins, so they love mudbaths; They are VERY smart and can learn to respond correctly to upwards of 100 words; Elephants eat a lot, but don’t digest a large percentage, which then comes out as elephant dung. Other animals have learned to follow elephant herds and pick through the elephant waste for undigested food to eat, and seeds which will grow into trees or bushes are also spread throughout the territory via elephant dung; Remember I wrote that there was more to learn about the name tags? 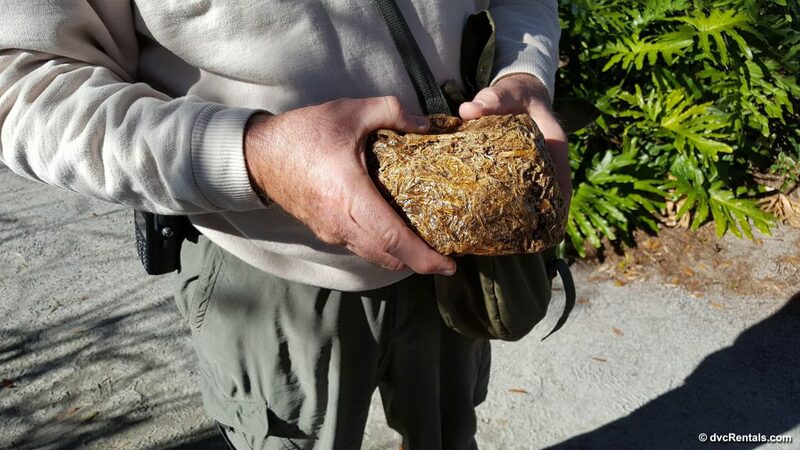 It turns out that Animal Kingdom elephants produce about a ton of dung every single day! To deal with this, and since much of the dung consists of undigested plants, the dung is recycled in various ways. One ways is it’s made into paper, and the nametag they give you for the tour is made from recycled (and cleaned) elephant poop! Since most elephant diets consist of grass and other rather tasteless foods, they love when they are given sweet treats such as fruit; Both male and female African elephants have tusks; Although the human ear cannot hear it, it’s been proven through research that elephants vocalize to one another to communicate certain things; Elephants watch out for one another, especially for their young. If a baby elephant is in trouble (i.e. stuck in the mud) the whole herd will work together to help the baby. After the talk and a question and answer session with Marc, we met a Cultural Representative from Botswana in Africa. A very sweet young lady, she told us what was being done to increase and save elephant populations in Africa. We were told that out of 54 countries in Africa, 37 have elephants. Due to habitat destruction, mostly done by humans, it is getting harder and harder for elephants to survive. As you can imagine, animals that big need a lot of territory, and the amount available to them is shrinking every day due to logging and other primarily human activities. Due to habitat loss, sometimes elephants go into villages looking for food, and as these large beasts search around they destroy buildings and can ruin an entire village. Instead of taking drastic measures, such as destroying the elephants, an ingenious solution to this problem was developed. It turns out elephants are very afraid of bees. So the villages that have elephants in the vicinity have learned to hang beehives around their areas. This is effective in keeping the elephants out, so both the elephants and villages stay safe. All in all I thought the tour was well done. If you know little about elephants you’ll learn a lot. To be fair I must be honest and say if you are well versed in Elephant information you probably won’t learn much new. But the energy of the Cast Members kept it interesting and fun for all. As mentioned earlier, don’t expect to get very close to the elephants. Disney advertises that you will be 80 to 100 feet away, but since these are animals and their movement is unpredictable, it’s luck of the draw how close you will get. Most of the photos I am publishing with this blog were taken using my phone camera with the lens zoomed in as much as possible. I did include one photo without a zoom so you can get a more realistic idea of how close we were. If I did this again I would have brought my larger SLR camera which has a better zoom lens and takes better quality photos than my phone. (I know, I should have thought of that before the tour, but hopefully my loss will be your gain!). As the tour ended we were all given buttons with photos of elephants from Disney’s Conservation Fund (a portion of the fee for the tour goes to The Fund). Then it was back into the van and we were walked back onstage. All in all, I thought the tour was a reasonable price and a very good experience. 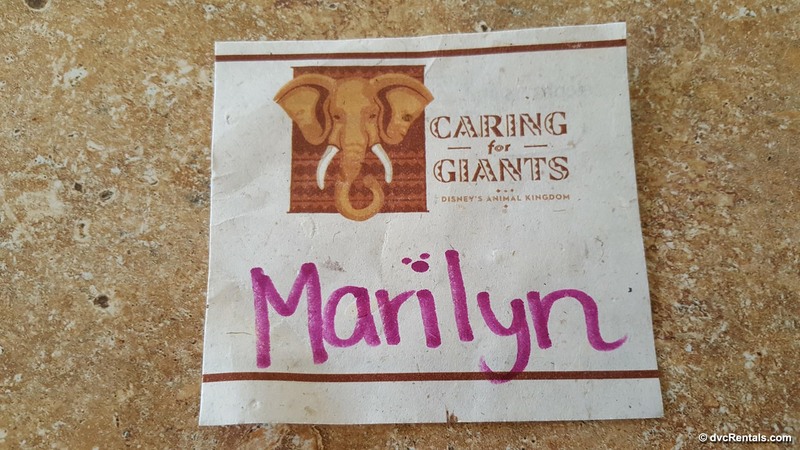 One thought on "Caring for Giants"
We did this as a surprise for my daughters 12th birthday in March. We loved it. I didn’t find there to be to much walking and you really don’t get to see all that much behind the scenes, just a touch. If you love elephants, it’s a great way to learn more about them.